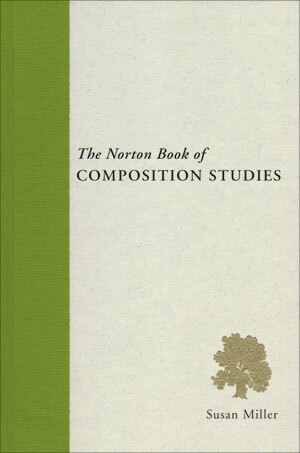 Susan Miller spoke at the University of Arizona yesterday about the Norton Anthology of Composition Studies which she edited, emphasizing that the book should be viewed as selected readings. The book, she explained, functions as its own context for the articles that it includes, although she asked the writers to also provide a brief 'why I wrote this' statement before their contributions. Miller explained that many of those in the beginning of the collection had been her friends and had passed away, so she took it upon herself to give the explanations for their articles, based on discussions she'd had with them all over the years. One of the more controversial stances that Miller explained having taken was her decision to exclude 'Rhetoric' from the Norton collection as a part of her larger view of rhetoric as a mode of instruction, and not evolving much further than the discussions of Aristotle and Plato propagated by the Germans as a part of their re-writing of history. Miller explained that she has been verbally yelled at by rooms full of academic colleagues who do not share this view, but she said that she came to this understanding after having taught rhetoric for nearly 20 years and feeling that she wasn't sure what it was she was teaching them and that she was a part of perpetuating the myth of God having touched Athens, making it the 'cradle of knowledge'. Miller felt she could no longer talk about rhetoric as though it hadn't been used, or understood by other civilizations. Politically, Miller argued, educators and administration would like to talk about rhetoric because they can conceptualize it as something they don't understand, whereas they can write off composition.